Spring has officially arrived and with it comes warmer weather, Easter-themed candy, and a strong urge to wear all things pastel. From mint and peach to lilac and blush, macaron-colored clothes and accessories are not only seasonally-appropriate, but they’re also super-trendy to boot. Not sure how to incorporate these hues into your wardrobe? We’re here to help! Simply scroll on down to check out four cute, trendy and college-appropriate ways to wear pastel this season. Rocking a monochrome outfit makes quite the stylish statement, especially when you wear various shades of über-trendy mint. Start by pairing a lacy blouse with colored jeans in a darker shade of mint. Flats keep things cute and casual, while a cross-body bag continues the monochrome look. Several stacked bracelets and a practical wristwatch add the finishing touches to this ensemble. There’s something quite edgy about pairing pastels with black — not only does it create a fab contrast, but it’s a surefire way to toughen up even the most delicate and daintiest of dresses. Take the above outfit, for example, where we styled a lavender-colored frock with a black moto jacket for a sweet look that packs a punch. Sculptural wedges continue the edgy vibe, while a “love”-adorned necklace speaks to the outfit’s feminine aesthetic. What’s better than wearing pastel for spring? Incorporating two (or more!) 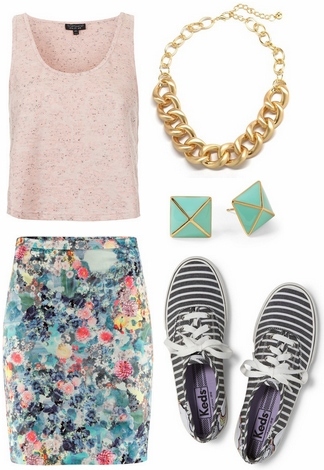 pastel pieces in a single outfit, of course! For a trendy look you can rock on campus, pair some super-stylish peach shorts with a simple gray v-neck tee. A pistachio-hued scarf adds another dose of pastel, while beige sandals keep things balanced. Accessorize with a gold statement ring, then grab a bold graphic tote to complete this look. Our first three outfits centered around their respective pastel shades, so for this final look, we wanted to do something a little different and treat a pastel piece like a neutral by pairing it with lots of super-bold items. Take a blush-colored tank and pair it with a trendy floral pencil skirt. Next, play with mixed patterns by adding black-and-white striped sneakers. A chain link necklace makes a classic, yet on-trend statement, while pyramid stud earrings mimic the coloring found on the skirt. 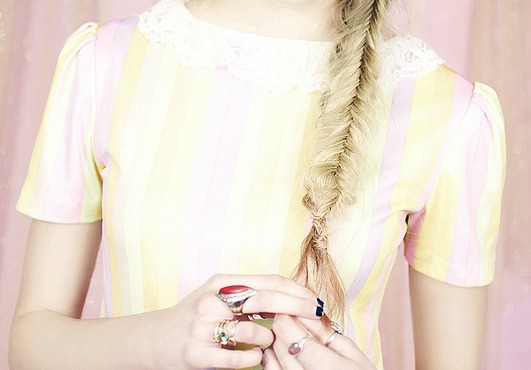 Do you like wearing pastel clothes and accessories? What’s your favorite pastel shade? Would you wear any of these outfits? Which one is your fave? Remember to let us know what you think by leaving a comment below! Next Ask CF: What Do I Pack for a Weekend Vacation?